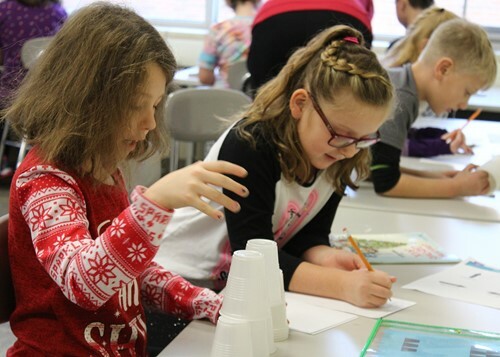 Each of Churchville-Chili’s three elementary schools has begun plans to create its own unique makerspace, with a little help from Monroe 2-Orleans BOCES School Library Services (SLS) and CaTS Instructional Technology Specialist Megan Hugg. Teachers hope to use the spaces for advanced hands-on projects for their students, aligned to any grade-level curricula. Students may gather to collaborate, build or invent. Projects might include coding or robotics, science or engineering experiments, visual arts, or journalism and video production. On its opening day, the first space to go live, Chestnut Ridge School’s Open Mind Zone was filled with second-grade students being introduced to coding as part of the international Computer Science Education Week. This was their very first experience with writing lines of code to control the actions of robots. Hugg started with a lesson called Coding Unplugged. There wasn’t a computer or a robot in sight: at this point the learning was all conceptual. Students moved freely about the space, working in teams, but also sharing experiences with other groups. From this basic beginning, they can quickly move on to working with real robots and programming kits, like Ozobots®, Dash & Dot®, littleBits®, LEGO® Mindstorm® and more. The resources available through BOCES will give librarians and teachers many avenues to choose from. The BOCES 2 School Library Services now has 19 different kinds of makerspace kits for schools, covering a range of interests and ages. With the Makerspace Collection, students can learn more about topics such as robotics, coding and circuitry in a way that is hands-on and engaging. More than 170 makerspace kits have been circulated to component school libraries so far this year, and over 100 kits are booked for the rest of this school year. There has been increasing interest in screen-less coding resources for younger students, and there are several options for that in the collection, including Cubettos®, Ozobots and Robot Turtles™.